This article discusses in brief who should switch to Linux and why. It has been two years since I first used Linux seriously and I have been its regular user since a year. Till now, Linux has never failed to impress me. This article discusses in brief who should switch to Linux and why. Linux (pronounced Line-ux or Lin-ux (Lin as in fin) or any other way) is a fast, stable and flexible open source operating system. It is a reimplementation of UNIX and was founded by Linus Torvalds in 1990s. UNIX was mainly used in mainframes of universities, research centers and big organizations at that time. Linux brought UNIX to PCs and servers for free and gave the users the right to change the source code according to their needs. Linux is one of the most successful and biggest open source projects. It has grown and matured a lot since these two decades, thanks to the efforts of numerous talented programmers who contributed to this project. One of the biggest plus points of Linux according to me is its wide hardware support and its ability to dwell into any computing environment. Linux usually comes in form of distributions (distros). There are other UNIX reimplementations like Linux. FreeBSD and Solaris are among few of the popular ones. Linux is just the kernel which can also be referred as the core. The kernel alone will not be of much use to the users. Distro vendors add clothes to flavor up the Linux kernel with essential software, commands, drivers, etc. in different ways to suit the end-users. There are numerous distros targeted for different user groups. It's Free - This is the first reason I give when someone asks me why I use Linux. Almost all Linux distributions are free of cost. This is a major reason why anyone should use Linux unless you do something in Windows which is not possible in Linux (there are VERY few such things) or if you love paying for things that can be done for free. It's open source - It means that the source code of Linux is open to all. Some people will say it as a disadvantage as people will be able to exploit the loopholes visible through the source code. This is a stupid statement as the loophole/bug is visible to all and many programmers come forward to patch it as soon as it is discovered/reported. As Linux is open source, programmers around the world are free to change, optimize and fix its source code. This results in a more stable, mature and bug-free code. It's always up-to-date - Linux is maintained by the open source community and is regularly updated according to the current technology. Thus, Linux is always equipped and compatible with bleeding edge technologies and at the same time equipped with latest security patches. On an average, a new Linux kernel update comes out every couple of months. Freedom – There are many Linux distros focused for different types of users and you have the choice to use the one that suits you. Also, you have the freedom to alter your Linux OS to suit your requirements. Live CD - Most Linux Distros have a Live CD which you can use to boot the entire Linux Distro from CD without touching your hard drive. It is a good practice to use a Live CD to try a distro before installing. You can also boot a Live CD image through USB flash drives. Security – Security is also one of the top reasons why someone should use Linux. Have you heard of any virus for Linux? I don’t think so. Call it lack of popularity compared to Windows OS or anything else, you won’t fall into any kind of virus trouble while using Linux. This means you save bucks which you would have otherwise invested in an anti-virus. Linux’s security makes it a popular choice for servers. Flexibility, stability and efficiency - Linux is Flexible and can be molded for any usage . It can be changed to run in supercomputers (8 of top 10 supercomputers run on Linux), embedded devices or anything else (like on a computer with 2MB RAM). Android, which is emerging as a leading OS for smartphones, is based on Linux (modified Linux kernel). Similar examples are MeeGo and Maemo. Linux is a very stable OS. It hardly crashes as the application runs in layers and doesn’t cause problems with the kernel. Servers running Linux stay for years without any downtime. As a matter of fact, 80% of the world’s servers run on LINUX. Very Helpful Community – Facing any problems with LINUX? Just post it on any popular Linux forum and you will find lots of people willing to help you. Some popular software not for Linux – Some of the popular software like Photoshop, Microsoft Office, etc. is not designed for Linux and some find their Linux alternatives not up to mark. Although there are ways to run these windows based software on Linux (using WINE), it doesn’t guarantee stability and support. Not many good games – This is one of the most disappointing things about Linux. There aren’t enough good games made for it. Most leading game developers make games for Windows. Although there are few nice games for Linux that might satisfy a casual gamer, a heavy gamer or someone looking forward for some games with breathtaking graphics or some popular titles would want to have a Windows installed along with LINUX. However, WINE successfully runs many popular Windows Games under Linux. Some simple tasks sometimes become complex - Although the Linux Distros and desktop environments are very user-friendly, there are times when they don’t work the way you want and you need to go back to the terminal (command line). 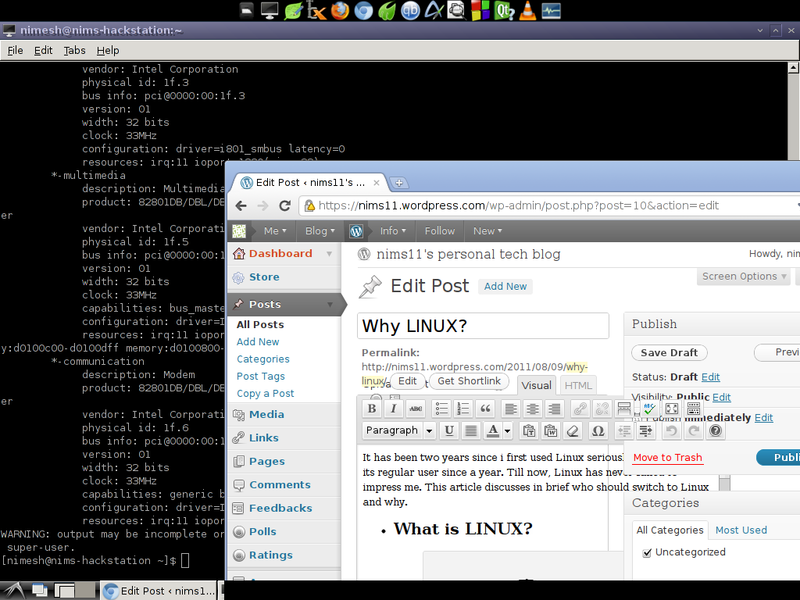 I usually face problems with lightweight distros which does not detect all my partitions and adds their entry to fstab. I have to mount them through terminal or manually add its entry to fstab. Installing software can also be troublesome for new users under some distros. Doing things through terminal might seem complex at first (I think it's fun! ), but new users get used to it in a couple of months. However, in the process of doing these things, you always learn something about how Linux works and how it does something. Hardware Support – Although Linux’s Hardware support is wide (wider than any other OS including Windows), there are still some hardware Linux doesn’t support or supports partially. Here are few points you should see if you are switching from Windows to Linux (or just keeping Linux as your secondary OS). It's possible to run Windows executable files (*.exe) in Linux using WINE. It supports wide variety windows apps and games like Microsoft Office, photoshop, counter strike, mass effect 2, etc. For a list of tested applications, click here. Although I prefer to use open source alternatives for popular Windows software, WINE often proves as an essential tool when I want to run some Windows app or play some good games. Wine too has its own set of issues while running Windows programs. So it's better to check the compatible apps list in its website. Wine has still a lot to develop and I believe it is a great tool especially for people switching to Linux from Windows. A project called Longene aims to include Windows support in the Linux Kernel with the help of Wine. Read more about this project here. Samba is an open source application that enables file and printer sharing with a Windows client. You can use Samba to access a shared Windows folders through Linux or share a Linux folder/drive to be accessible through Windows. Read more about accessing a shared Windows folders here. ntfs-3g is a very handy application to mount and manage read/write operations on a ntfs drive. Learn more about its usage here. Ubuntu – It is the most popular Linux Distro according to distrowatch.com. It is a perfect distro for both beginner and advanced users. It comes with a Wubi installer which installs Ubuntu from Windows to run just like any Windows application. It saves you from doing the partitioning by creating a disk image inside a pre-existing partition although I discourage installation through Wubi as Ubuntu installed this way doesn’t support hibernation and the installation is less stable as it becomes dependent on the stability of the windows drive. But new users can use this method to get a taste of Linux and then go try installing it the way it was intended to. You can also try Kubuntu which is just Ubuntu with KDE graphical environment instead of GNOME. Linux Mint - It is an Ubuntu based Distro that makes thing easy for new users. Most new users get annoyed when they cannot play their favorite music as the mp3 codecs are missing after installation of many distros. Linux Mint comes with most codecs pre-installed which helps new users feel like home. I personally recommend this distro to new users. Mint was my first Linux Distro after I got seriously into Linux and I used it for about 6 months before switching to Arch Linux. Fedora – It is a Red Hat sponsored project and a very popular Distro out there. It’s always in line with the latest technology and its RPM packages support make it easier to install software. Arch Linux – My current Distro, Arch Linux is a flexible and simple distro that allows user to customize it according to what they need. Although the customization process is pretty lengthy and can take a whole day, you end up with a very efficient distro which only has features you want. The best part while using Arch Linux is that you learn a lot about how Linux works. This Distro is not recommended for beginners and should be used by those who have some Linux experience. I recommend the beginners to use any of the distro listed above Arch Linux and then try Arch after a few months. An excellent guide on Arch Linux installation can be found here. Also go through the beginner’s guide in the Arch Linux Wiki through its official website. I use Arch Linux on my decent Desktop which has a core 2 duo processor with 1GB RAM as well as my low-end 5-6 year old Laptop which has 256 MB of RAM and 1.6 GHz intel M processor. Arch performs great in both my computers! Puppy Linux – Puppy Linux is an example of Linux’s flexibility. This 128MB distro that can run from CD, USB or hard drive is a great Linux Distro for lower-end computers. It has all basic functions that an OS should perform and thus can be used to breathe life into an old PC. Linux is an OS for all. The best part about it is that it still has a lot of cream to add to itself. So, use it to know more about it. Introduction to wxWidgets - 2. Some of your off-site images seem to have gone for good. Mind to fix it? I code every day in Windows environment , but I miss the Virtual Desktops of any Linux distro ( I tried different open source alternative for windows , but none works as expected.) Also what I miss is the fact that when Linux is started ( the user interface appears) is ready to use. Look at any Windows , after the taskbar is up and desktop is displayed , it take another around 30 seconds until the startup apps are loaded and barely you can move the mouse in this time. I agree with this article in its breadth, whether CodeProject is the right place for it to have been posted is a different topic... However, one thing I believe the author has overlooked is the use of Linux as a Host system for other operating systems in the form of Virtual machines. You have made mention of using WINE, indeed giving good examples of its use, however one thing many people fail to realise is that if they operated their machine (save for those needing perhaps gaming standard graphics) as a host of other (potentially multiple) Virtual machines they could not only host Microsoft Windows within, but improve uptime, productivity and reduce costs. You could perhaps suggest the use of VMWare Player (which is free), running it on a host of perhaps Ubuntu (which is also free), you could homogenise your PC hardware in an office environment, running moderately powered machines hosting and virtualizing the platform for use by Windows in VMWare player. Then, when you have a break down, you just pop the virtual machine image into a new Linux box fire up VMware again and carry on right where you were before... Regular backups of your Virtual image and you're never going to be without a machine for a day whilst you re-install or restore from a backup. No ghastly Windows reinstalls, no ghastly worry over Windows Drivers or network or printing issues, you level the playing field and everyone gets the same from the same kit, your IT department benefit for they have to only support one Linux Distro with drivers and components and they are blanket covered on the virtual machines as even if all goes wrong the end user can simply get a new image, not need a whole new physical machine. If your company turns a profit and has capital investment space for IT infrastructure you can improve the PC's hosting Linux, your Windows operation remains completely unchanged, users simply use bigger, better, faster machines than before and feel the benefit almost immediately. You could have your virtual machine images on large flash drives or external hard drives, meaning people could effectively hot desk, literally carrying their Windows based work environment with them. And yes all this can be done ignoring Microsoft software, you can test our distro's with a Virtual Machine, install your favourite flavour of Linux, but try the others in VMware Player! if you have Windows already, install VMware player and try out Linux without disturbing your Windows life at all! (Please note: There are other Virtual Machine platforms such as QEMU & Virtual Box, VMware just happens to be my favourite). (And yes, I am a complete Virtual Machine fan boy - well fan man - but I believe this is a strong reason to use Linux in the corporate environment, as strong as any of the other arguments in this article as a whole). Biased articles have plenty of other places to live - other than codeproject. Your article implies Windows as being a lesser product - yet you promote wine. Ironic? And given we have heard this claim for 20 years, linux is still far from being ready to take over the desktop. The final straw was your Security push ... suggest you open up google and search for "linux virus". Never heard of a virus ... or never listened to another point of view. First of all, i haven't implied Windows as a lesser product. Although i have compared it with Linux in two or three instances in the blog, the aim of my article was still sticking to "Why Linux?" instead of "Why not Windows?" or "Why Linux over Windows?". So there is no question of being biased. I have promoted Wine because i realize and appreciate the huge app base of Windows. As for your ending lines, okay, a few of linux virus do exist, none of which have been reported as widespread and critical. Also, most of the files you get from somewhere will not have executable flag set up for the user in Linux, so the user ain't helpless here. even if the user sets execution flag and executes it, it will never affect anything other than the user home directory unless the user foolishly gives it the superuser rights without knowing what it does. But i don't deny that it is impossible of a Linux Virus outbreak. Its nice article though, but such articles are always a hot spot for fan boys flame war. But i still dont see why such article was necessary here. Its a generic article where Codeproject is not right place to be posted, or i may not be right person to comment on this. I shall leave it to Admins here to take care off. There are many blogs/articles/web sites peeps can take a look for Linux features, etc. No, it's not. Bugs get fixed when there's someone interested in fixing them. The fact that it's downloadable for free doesn't mean that there's no cost of ownership. That means that you're posting half a story here; there's a huge difference in (operational) cost between a Windows/Sql server combination and Linux/Oracle (or MySql). I like the article, but it seems biased toward Linux. Its free as in Freedom and not in free BEER. And true regarding the UPDATES most of the times. Its not just bugs Mr. its even in features too. Tell me after NTFS FS, whats new? In linux, u have new FS every now and then. No no, i am not here for Windows Vs Linux or such flame wars plz. Lets accept the facts. It took alot years for MS to get some thing on their OS after XP, some thing different and stuffs. But on linux, its much faster. KDE with its plasma feature was long released before even win vista got matured or released or what so ever. Something isn't better simply because it's new, that only works with managers. And yes, other Operating Systems change too. ..what did you say about flame wars? I do like my Linux-box, but it still can't replace my XP machine. There's a good reason why people pay for Windows, in the presence of a free alternative. No i am not into flame war thingy nor was intended towards it. Jst spoke the facts. I feel your views on bug fixing is partially correct because when it comes to linux vendors, especially the enterprise vendors will want to patch up the bugs, especially the critical ones in the kernel they are bundling their OS with. i agree that smaller bugs take more time to get patched than it should have taken. I am not much aware of the real life operational cost difference between Win/Sql and linux/mySql. Although the training cost is higher for Linux solution, but other costs like that of upgrade and downtime due to maintenance should be lower. Still i don't hold enough knowledge in this aspect to make any concrete statement and start a war. This article is about Why Linux and not about "Why Not Windows" as i also appreciate windows for what it has in it and it is still at the moment indispensable OS alongside Linux for me even if i do most of my work in Linux. i agree that smaller bugs take more time to get patched than it should have taken. I didn't say that; you can't have those kind of expectations when people are volunteering on the project. but other costs like that of upgrade and downtime due to maintenance should be lower. Did you go through the trouble of looking up the average downtime of a modern Windows-server? Nope, It is a known fact through surveys that average uptime of Linux beats that of Windows. I'd agree if you'd be referring to Linux/Apache vs Windows/IIS and your uptime would refer to the availability of a webapp, but I doubt that it refers to the OS. thats what i am referring to. i assumed server solutions beforehand. Still, my bad for the confusion. Ok already seeing a flame war going on here. Most of my friends do work in NetAPPS and GoDaddy companies. Yes they handle sys admin side of work both on win and linux. And i do not have a concrete link or image when i am saying this, buts its a fact data i got from them that, wins down time is more and frequent than linux. Well my final words will be, lets stick with the facts and not be a fan boys thought we are. But with this topic, i am going to stick with facts and i am not going to comment more on this. Waste of time and energy.